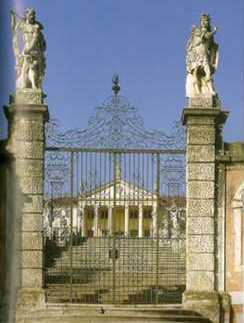 Italian Renaissance Architecture in Veneto. Built around 1542, this is the very first villa designed by Andrea Palladio: an expert eye can notice its exterior lacking someway the architectural perfection inspired by the classic Greek/Roman style, characteristic of the later Palladian buildings. Instead this villa reminds of the earlier architectural style typical of the late 1400’s Veneto countryside. Despite that, the villa is very interesting and the surrounding natural setting is beautiful. The building is located upon a hill...by the way it lies not far away from where I live, so there was a time in the past when I used to attend one of the summer concerts held outdoor in the villa’s huge garden, after having had dinner in the nearby agriturismo or restaurant. Also good to know for people like me who love to pedal, this area is surrounded by rolling hills, ideal for hikers and bikers. The interior of the villa hosts fine ancient frescoes and decorations, and in the second floor there is a collection of 19th century Italian paintings. The wonderful and immense park surrounding the villa hosts centuries-old trees and a small lake. Behind the villa you’ll also admire some 1700’s Italianate gardens dating back to the late 1600’s, embellished with about 50 marble statues, columns and fountains. Nowadays the villa, which is a Unesco Heritage Site, hosts gala dinners, receptions, meetings and conventions. Groups can request and book visits also in different periods. Located in a more elevated position just a few steps away from the above mentioned Villa Godi Malinverni, it rises this majestic 1500’s villa overlooking the scenic landscape beneath. Scholars usually ascribe it to the architect Palladio. However, there are no documents that demonstrate that, and it still remains a controversial matter. The eye-catching gate and the suggesting long steps leading up to the mansion are more recent, dating back to the early 1700’s. Noteworthy the big 1800’s romantic garden adorned with old marble statues. 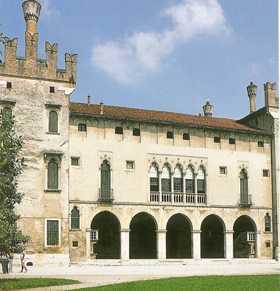 It is the main attraction in the town of Thiene, about 15 Km nothward of Vicenza,and it is located in its historical center. 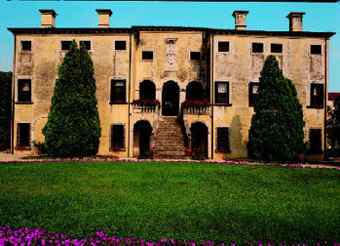 It can hardly be catalogued as part of the Italian Renaissance architecture: it is a bit older compared to the above mentioned villas, thus its style does not remind of the typical Veneto’s Palladian architecture which draws inspiration from the ancient Roman times. Instead it’s about a unique example of a palace, a blending between a Middle Ages castle and a Renaissance palace. In fact it was built between the 1400s’and 1500s' inside a medieval circle of walls, and was strongly influenced by the gothic style palaces of Venice. You can see from the photo that the downstairs windows are typically medieval, while upstairs is characterized by a renaissance style. Today the castle/palace hosts gala dinners (you can enjoy your aperitiv in the 1700's stables), wedding receptions and business meetings. Visits are open anytime to groups of a minimun of 15 persons, however in this case booking is required.